I know we have pretty good eye care through the district, but I think I’m going to complain about the quality of my eyeglass prescription. Because when I went to Newsday.com the other day it actually looked like one of their editors wrote a piece acknowledging that FACTORS OTHER THAN “BAD” TEACHERS might be to blame for some students under-performing. New data reveals our public—not private—school system is among the best in the world. With Jeb Bush looking like a strong contender for the 2016 Republican presidential nomination, here’s a look at his record on education. When we talk about how the reform agenda is taking the joy out of learning, this argument is often received as the kind of soft, anti-competitive coddling that is weakening our students. This article, from The Atlantic, articulates a sound rationale for why we need to bring joy back. Not only is this a dreary and awful way to treat children, it makes no sense educationally. Decades of research have shown that in order to acquire skills and real knowledge in school, kids need to want to learn. You can force a child to stay in his or her seat, fill out a worksheet, or practice division. But you can’t force a person to think carefully, enjoy books, digest complex information, or develop a taste for learning. To make that happen, you have to help the child find pleasure in learning—to see school as a source of joy. Recently we posted an article about a report saying that the requirement for kids to read by the end of kindergarten may be harmful to sum. Here’s a piece by a pre-K teacher talking about her experience. We mentioned yesterday that the Senate seems to be leaning away from maintaining the testing requirement, and that two house members introduced a bill to end federally mandated testing. However, John Kline, the head of the House Education Committee, continues to support federal testing requirements, albeit with less US government involvement in consequences. We also mentioned yesterday that Cuomo’s agenda will be in the hands of the legislature. Today, Sheldon Silver, Speaker of the New York State Assembly, was arrested on corruption charges. It is too early to tell exactly what this will mean – but Silver has been a supporter of unions and is opposed to much of Cuomo’s agenda. If he resigns or is forced out if convicted, his replacement is likely to be someone in Cuomo’s pocket. As noted, under the Governor’s plan only 50% of a teacher’s evaluation would be based on observations, with one of two observations being conducted by an outside “expert.” But things are actually WORSE THAN THAT. The school administrator’s observation would count for 15% of the score while the outsider’s rating would count for 35%. The link to Peter Greene’s post that features some other teacher’s letters posted in the comment section had a bad link. It has been corrected on the original post, and you can get there by clicking here. One of the earliest complaints about federal testing mandates (and still a very valid one) is that the focus on ELA and Math has crowded out valuable instruction in other areas, such as the arts and humanities. In this vein, the National Council for the Social Studies is pushing to have a provision added to the ESEA “establishing a competitive grant program that will support innovative, research-based approaches to civic learning, history, geography and economics,… for low-income elementary school and secondary school students…” Read the whole letter and take action by clicking here. (Thanks to Ruth Squillace for the link). A little heads up. When you get to number 3 below, you may be really tempted to throw in the towel, shut your door, and just pray you make it to retirement. All I can say is that when you get to work tomorrow, please take a look at your students and remember that, ultimately, they are the reason we need to keep fighting. 1) On February 23rd there will be a general membership meeting. Lucille asked that everyone please make every effort to attend. It will be 3:15 at the High School Library. 2) Senate hearings began today on the re-authorization of NCLB. During the hearing, Chairman Lamar Alexander quoted New York principal Carol Burris on the topic of local control. The committee also heard testimony from, amazingly, a PUBLIC SCHOOL TEACHER(!). The quote from Ms. Burris (an outspoken opponent of the current standardized testing program) and the teacher’s testimony (again, strongly against standardized testing), are further confirmation of the direction that the committee is leaning. On this particular fight, the momentum is currently in our favor, but it’s not over – THIS BATTLE IS OURS TO LOSE. Sen. Alexander has stated that many of his constituents have come out strongly against testing, but don’t doubt for a minute that lobbyists for the testing industry and charter schools won’t be fighting to keep testing in place. We must make sure our voices are heard. Of course, even if federal mandates are eliminated, it will be up to NYSED to decide what happens here. And that’s not looking very promising. 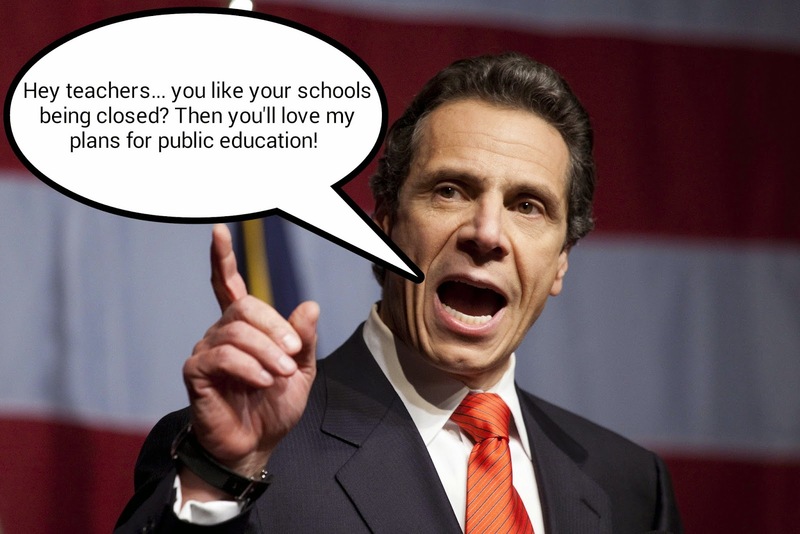 3) In his state of the State address today, Governor Cuomo upped the ante even further in his all out war against public school teachers. Only a few weeks after suggesting that state test scores should account for 40% of a teacher’s evaluation, Cuomo is now recommending that standardized tests comprise 50% of a teacher’s score. Even the 50% figure is misleading, as a teacher rated ineffective on test scores would be considered ineffective, regardless of their observations, meaning that that teachers will be essentially graded 100% by test scores. Local control of evaluations would be replaced by scoring bands set at the state level. Evaluations would require two observations, one of which would be conducted by someone from outside the district, such as a SUNY professor or an “independent” evaluator from a list provided by the state. An additional $1.2 Billion of school aid was proposed, conditional on acceptance of the aforementioned “reforms,” thus pitting teaches against communities. The governor will be aggressively pushing this agenda, but none of it can come to fruition without the legislature, so we MUST LET OUR LAWMAKERS KNOW that these changes will cause great harm to public education and do lasting damage to our children. In an incredibly gutsy move, Comsewogue science teacher and PJSTA President Beth Dimino has become the first local teacher to publicly announce that she is refusing to administer the state tests this year. Will others follow? Ms. Diminio has the support of her Superintendent, Dr. Rella, How this will pan out in terms of the state’s reaction is still anyone’s guess. Also on the refusing tests front, the Comsewogue school district is taking a stand against field testing. Again will others follow? In a Newsday OpEd piece, Pat Med Supt. Mike Hynes looks back at the “Nation at Risk” report and how far we have strayed from the recommendations of that report (and from common sense). A new poll shows that only 1/3 of New Yorkers support the Common Core, while just about half oppose it. And while Cuomo has roughly 50/50 approval ratings, only 18% trust his leadership on education issues. While we’re very familiar with all the studies showing how the US is falling behind, here’s a report that puts it all in context through a much more realistic and broad look at the relevant data. A video released by the Alliance for Quality Education, released prior to the state of the state, rips into the Governor on the issues of equity and the reform agenda. Also on the topic of equity, while a recent post pointed out the growing gaps in the US and in New York State. a new report shows that the gap between rich and poor districts is growing especially fast on Long Island. From the department of “wouldn’t that be nice,” the new governor of Pennsylvania selected a veteran educator as the Commissioner of Education. Feeling like a crappy teacher? You’re not alone. If nothing else it might help to understand just why so many of us feel this way. We all too often find ourselves needing to comfort children dealing with loss. Here’s a website that offers suggestions to help these students cope with their grief. As previously noted, the time is now for everyone with an interest in public education (i.e. everyone) to contact Senate Education Committee chair Lamar Alexander about the reauthorization of NCLB. (FixingNCLB@help.senate.gov) If you’re struggling with what to say in your email, here is a selection of links on the topic to give you some ammo. Take what you want from them, or just copy and paste a link and ask Sen Alexander to read it and share it with the committee. Here’s Carol Burris’ open letter to Sen. Alexander about the faults with, and fixes for, NCLB. This video of linguist, philosopher, cognitive scientist, and political commentator Noam Chomsky covers a lot of ground and really digs into the insidiousness of standardized testing. An NEA Survey reveals ever declining morale among teachers and the fact that almost half of America’s teachers have thought about leaving the profession due to standardized testing. Even as Jay Matthews of The Washington Post asserts that “it is difficult to argue that teachers should not be measured, at least in part, on how well their students are doing,” his column highlights the folly of tying teacher evaluations to the current testing regimen. To see how some other folks are framing their comments to the Senate Ed. Committee, check out the comments on Peter Greene’s blog post. Sticking with Curmuducation, here’s another post from Peter Greene listing the standard defenses of annual testing and why they all collapse under scrutiny. Finally, when you send your letter, consider posting it as a comment below to help others generate ideas. Remember, send your comments to FixingNCLB@help.senate.gov and remind everyone you know to do the same.